Pakistan Prime Minister Raja Pervez Ashraf on Monday got a three-week breather from the Supreme Court in a contempt case for failing to reopen graft cases against President Asif Ali Zardari, a long-running legal wrangle that had cost his predecessor his job. 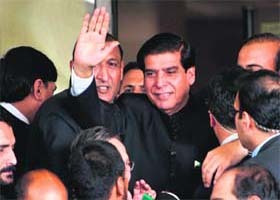 Pakistan Prime Minister Raja Pervez Ashraf waves upon his arrival at the Supreme Court in Islamabad on Monday. Taliban Islamist insurgents beheaded 17 civilians, including two women, who were holding a party with music in a southern Afghanistan village, officials said today. "I can confirm that this is the work of the Taliban," said Helmand provincial governor's spokesman Daud Ahmadi, referring to the hardliners notorious during their rule for public executions and the suppression of music and parties. Three Shia men were killed in a sectarian attack, while five others died when gunmen targeted buses in the restive Balochistan province of southwest Pakistan, police officials said today. Rebels shot down a Syrian helicopter gunship that was firing on the Damascus neighbourhood of Jobar during heavy fighting today between rebels and the military, witnesses said. Syrian state television said in a news flash a helicopter had crashed in Damascus, but offered no further details. Iran has hit out at the US, saying the holding of the 16th NAM Summit in Tehran proves the "failure" of America's "threat and sanction" policy against the oil-rich country. A strong earkthquake measuring 7.4 on the Richter scale shook an area in the Pacific Ocean off the coast of El Salvador early today, the US Geological Survey (USGS) said. The five-judge Bench headed by Justice Asif Saeed Khosa initially adjourned the case till September 12, but subsequently put it off till September 18 after Ashraf said he would be away on an official visit to China till September 14. The Bench further directed the premier to personally appear at the next hearing. Ashraf (61) became the second premier to appear before the court to face a contempt charge for refusing to revive the corruption cases against Zardari in Switzerland. His predecessor, Yousuf Raza Gilani, was convicted of contempt and disqualified in June. During the 45-minutes of hearing, the judges repeatedly asked Ashraf to give a commitment about approaching the Swiss authorities to reopen the graft cases against Zardari. The Bench said Ashraf must ensure a letter is written to Swiss authorities asking them to reopen corruption cases against Zardari. Justice Khosa said Ashraf did not have to write the letter himself. He could nominate someone else to write it. Justice Khosa said the government has to withdraw an earlier letter written in 2008, through which the Pakistan Government had pulled out of its claim in the Swiss case allegedly involving $60 million of graft money in which Zardari’s name had also figured. In reply, Ashraf said, "I will make a sincere effort to solve this issue in a way that the dignity and honour of the Supreme Court will be maintained." "It is my firm belief that it is not in Pakistan's interest to linger on this issue. I am ready to give a positive commitment to this court that I will resolve this issue," he said. Ashraf said he wanted to resolve the issue and would never like to be remembered in history as the one who defied court orders. "Two women and 15 men were beheaded. They were partying with music in an area under the control of the Taliban," he said. Nematullah Khan, the Musa Qala district chief, confirmed that the villagers had organised a party with music, and one local official said he suspected that the two women had been dancing. During their 1996-2001 rule in Afghanistan, the Taliban, waging a fierce insurgency against the NATO-backed government of President Hamid Karzai, also tried to stop the mixing of men and women who were not related. The latest atrocity happened near Zamindawar village, an area on the border between Kajaki and Musa Qala districts where the Taliban is active. The insurgents have in the past been blamed for beheading local villagers, mostly over charges of spying for Afghanistan and US-led NATO forces. Residents said they saw the helicopter set ablaze as rebels fired assault rifles and heavy machineguns, but none of those interviewed could be sure what, if anything, had hit the craft. Video posted by activists on the Internet showed the belly of the aircraft engulfed in flames as it fell in a trail of smoke. Rebels could be heard shouting "Allahu akbar (God is great)". The footage did not show the helicopter being hit. "I watched the helicopter for an hour," said an activist who filmed video of the incident, giving his name only as Tarek. "It was opening fire. But I missed the moment it was hit. I heard what sounded like an explosion and a very strange squeak as it was falling down," he said. The helicopter crashed in a narrow residential street in Qaboun, a northeastern district on the outskirts of the capital. "The rebels had been trying to hit it for about an hour. Finally they did," said activist Abu Bakr.Clashes and shelling intensified in the eastern outskirts of Damascus after the helicopter came down, activists said. Beirut: At least 14 more bodies have been found in the town of Daraya near Damascus after activists reported a gruesome "massacre" there in a five-day assault by regime forces, a watchdog said on Monday. 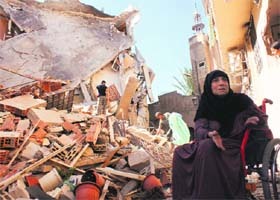 The Syrian Observatory for Human Rights had reported on Sunday the discovery of 320 bodies in Daraya. Iran has hit out at the US, saying the holding of the 16th NAM Summit in Tehran proves the "failure" of America's "threat and sanction" policy against the oil-rich country. Iranian Deputy Foreign Minister for Arab and African Affairs Hossein Amirabdollahian said the anti-Iran policies of the US-led Western nations are doomed for failure. Amirabdollahian described the presence of heads of states and high ranking delegations of NAM member countries in Tehran as important "under such critical conditions arising from developments in the Middle East and North Africa and its coincidence with Islamic awakening movement" in the region. "The threat and sanction policy [of the US] has failed despite pressures exerted on Iran by the US and some other countries," the official IRNA news agency quoted Amirabdollahian as saying. He also said Iran's hosting of the summit would improve its position in the international fora, while the US and European Union are facing severe financial crisis. During the summit, Iran will take over the NAM rotating presidency from Egypt for the next three years. While Western countries have tried to downplay Iran holding the summit, Tehran sees it as a major diplomatic win. The US and other western countries have accused Iran of following a secretive nuclear weapons programme even though Tehran vehemently denies it. The US feels that Tehran will use the opportunity of hosting the 120-nation group's summit for furthering its propaganda and had behind the curtains asked many countries to skip the event.